Just spoke with the seller today. He insists that it's korina. And says that all LE with serial starting 00xxxxx are korina. That's first time I hear that. Still have my 76 with 2 serails. I have another one of these guitars. Its exact identity and history is a mystery because when I bought it the serial number decal was long gone, but from what I've learned from reading this thread it's impossible to accurately date them anyway. It hasn't been played for many years and I'm currently in the process of providing it with some much needed TLC. I'll post some pictures in the next week or so. Any comments or information about it would be greatly appreciated. The volume pots date from the second week of 1976 and measure 325k/320k. The tone pot is a replacement. The neck has been broken and repaired at the (short) tenon. If it has been refinished at any point then this was before the neck repair. The control cavity has had a sticker or piece of tape inside at some point, this has since disappeared leaving bare wood beneath. The profile of the neck is bigger than ANY measured and listed in the above list of serial numbers. It measures over an inch at the first fret. The cover of the control cavity is brown. It has the name 'M Trafford' and a number, 'WO234175' scratched into the finish between the pickups and under the pickguard. The pickguard is chrome. The pickups have been changed, a Seymour Duncan Pearly Gates in the bridge and a DiMarzio Fred in the neck. The frets look original, giant frets and really neat on the ends. The lead to the output jack is braided and heat-shrinked red. Jack plate is gold anodised aluminium. The case has the same white trim as the later Gibson E2, and I assume isn't the original case. Hopefully M Trafford is reading this and he can tell me where the decal has gone. When was it broken? Have the neck and body always been a couple? Was it an L.E. or a non L.E.? A long list of issues, I admit, but it's still the best playing, best sounding guitar I've ever seen. Last edited by ianjunior; 01-03-16 at 11:47 AM. Would you have some pictures of it to share? That may help. Yeah I'll take some this week. At the moment I have literally the worst camera ever made and it really needs some clear photos, I agree. I have a nice '76 explorer and need an advice. The jackplate is broken, has been glued up but would like to change it. Problem is I haven't found the right one, the new ones are all rectangular while the one I have is square, but smaller than the LP ones...so I did not find the correct jackplate yet. greetings from Germany. I just purchase 00230517. That is already on the list. Here´s our (4Sound Gothenburg SWEDEN) Explorer 76´ LE (s/n 00230210). Oh yeah. There's one, right there! Old picture of the '76 Explorer my brother bought in 1982 at 4 Winds Music in St Cloud, MN for a whopping $175. He still has it. I just sold 00240878 non LE nat (on the list). Had a large neck and sounded I N C R E D I B L E !! I've got a '76 LE; s/n 00233336. I think it's the one Luke had previously. Great guitar. Last edited by thamrick; 12-24-16 at 03:45 PM. What do you guys make of this serial? LE 76 Explorer. Mine, big neck. 00233818 - cannot be anything else if it's a LE. It's on the SN list on the first page of this thread. You see more often that the decals are somewhat 'melted' by the lacquer and become a little warped. I have an Explorer that was sold to me many years ago as a 76. It's been refinished, repaired, rebuilt. it had a neck joint that had a crack that was well repaired, doweled and glued, very solid. Refinish in Transparent Red for lack of a better name. Still has the original Ttop bridge pickup. I'm sure the bridge is not supposed to be a nashville. Obviously the switch is not where its supposed to be, and the pickguard is not original. the serial number was lost to the refin. The neck is not a baseball bat thickness, but not thin either, very comfy. Just wondering if it could really be a 76 or near there by just looking. Thanks - my guess as well. I've had all sorts suggested, including 0293313! As per the front page, the neck is very large. 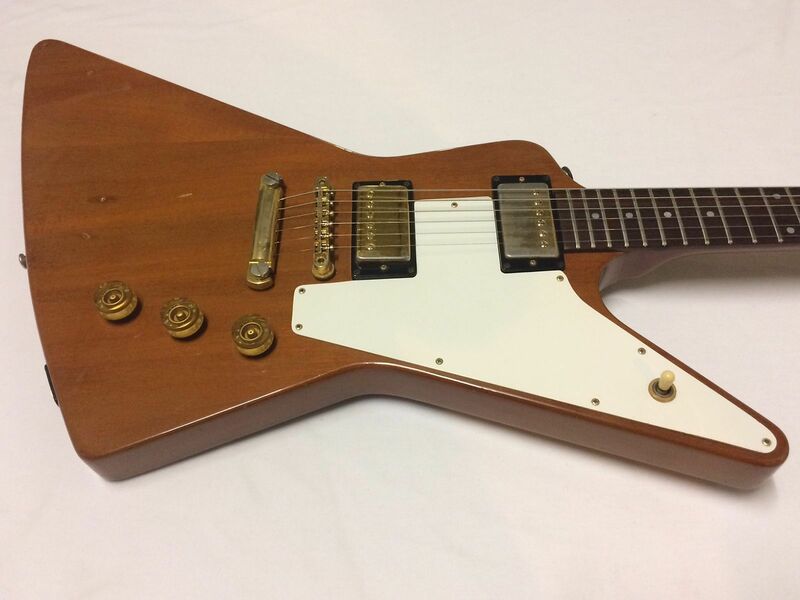 Thought I would mention that there is currently an original '76 Limited Edition Explorer for sale in my area (San Diego) on Craigslist (I have no affiliation). I was curious, so checked it out one evening a couple weeks ago. The guitar appears to be bone stock with no breaks, which as we know is rare in and of itself for this model. Although it's a limited edition model, the neck isn't all that thick at the nut. I was looking for a thicker neck, which is why I ended up deciding to pass. It does thicken up as you get closer to the 12th fret. The body is 3-piece mahogany. The guitar played easily and well, though it could use a good setup. I didn't pull the pickups or open up the control cavity to check originality there. Overall, a rare, (apparently) unmolested example. Count me in... '76 LE natural serial 00232685. One of my all time faves... was fs at Willies at some point in it's life given I found one of their handwritten cards in the case pocket. MASSIVE but Glorious neck... like you sawed a bat in half... and very light especially given the massive neck at 7lb, 12 oz. I had a 76 LE all original I bought off the original owner. Massive neck, light guitar...neck reminded me of those old Yamaha cheap nylon string classicals. Had to let it go, just couldn't play that neck . Sounded decent but nothing spectacular. Sure looked cool tho. Wonder why Gibson decided to go so massive on the neck...far bigger than any original 50s Gibson neck ever was. I play mine every week. Love it. It has mid 60’s Pat No decal p/ups and long PAF style magnets. I wouldn’t mind some original TarBacks to compare, but I cant imagine they would sound any better than it does now. Never pulled the pups in mine... just assumed they were tarbacks, but the guitar sounds just amazing. For rock... I could own this and no other guitar. My 75 V has pat stickers... not sure what the history is on these, but guessing they were in a pickup bin, and what you got... you got. The neck is massive... but for me, it plays like butter. I love the big neck and its shaped in a way that just feels right to me. For comparison (again) my 75 V has a big neck, but not like the explorer. The 75 V was more in line with a 68GT neck (used to have) but the explorer is in a 'never been there before' category. Mine is not only super fat, it's wide too. Especially up around the 12th. Truly massive and makes an R8 feel like an R0! Makes an R8 feel like an R0- that's a great way to describe these lol. I remember a buddy (member here) calling me up and telling me I need to buy this thing because it's amazing. I had never paid any attention to these and knew nothing about them... I played it and thought to myself, I could sell all of my LPs and just have this... it played effortlessly and sounded just unbelievable... and I went home with it 5 minutes after first picking it up. I can say I sold all my old LPs at some point after getting my 76LE, it's that good (even if it's not exactly the same tone & vibe). 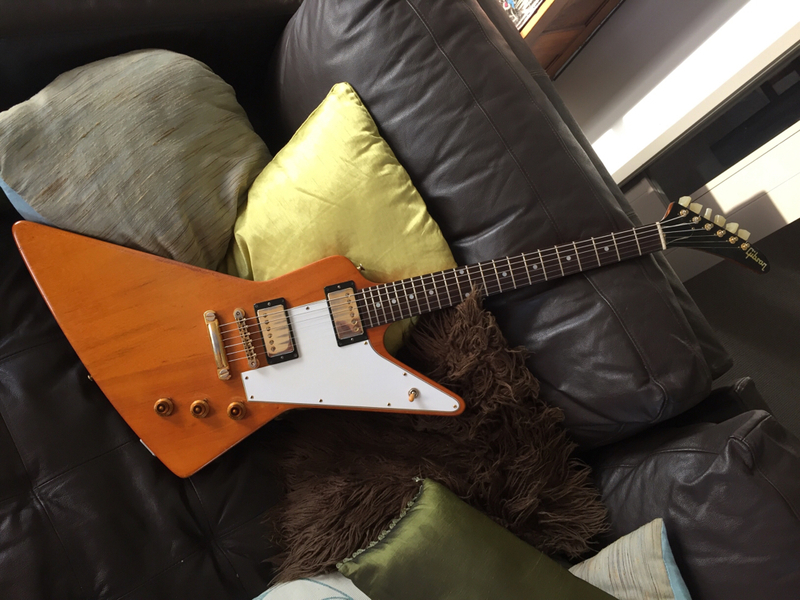 I've recently acquired a 1976 (I think) Explorer. Pots age to that anyway. From the pickup cavities, I think the guitar was originally black, but there are also very minor signs of white residue around the dot markers on the side of the neck. The guitar has been stripped back to natural at some point in it's past. It has a very chunky neck and the remaining visible serial numbers stamped on the end of the headstock are 67336. So from the list below I'm thinking this is one of the unusual/pre-production guitars. If the first number of the serial code was 9 it would fit perfectly in that batch. It would be interesting to compare serial numbers of the LE and non LE '76s to see if there is any logic to these. First impression is that all LE's have the big necks, and (at least) some of the non LE's as well. Plus LE's are not limited to natural finished guitars. "If" the serial numbers on the '76 LE Explorers were applied in chronological sequence, the known pot codes would indicate that Gibson did not start shipping the run of Explorers until around June (my #00229622 has one 7621 pot). I wrote to Gibson for the shipping dates of my guitar and that of a non-LE guitar with 7621 pots, but was informed that there are no ledgers for this period available. If this is correct, it will be very hard to verify when these guitars actually were manufactured and/or shipped. A number of 1976 guitars also have stamped manufacturing dates in the control cavity. The data derived from these also adds to the conclusion that the serial numbers within the pre-assigned ranges may have been applied randomly.